Generally speaking, crabs don’t conjure up the same images of luxury that its shellfish cousin lobster does. Sure, you’ll find upscale restaurants that’ll have the crustacean in one of their dishes, but it’s never the focus of the restaurant. It’s probably because eating it is a messy experience. Say “crab” and you’ll likely think of eating unlimited alimango by the seaside, utensils very much optional, maybe even wearing a bib and rolling up your sleeve so you can chomp on it more freely. All in all: not very fine dining. Thankfully, Ministry of Crab, the new restaurant opening at Shangri-la at The Fort, doesn’t seem to be too bothered with that. Walking into the restaurant, it’s easy to forget that it’s supposed to be a seafood joint. 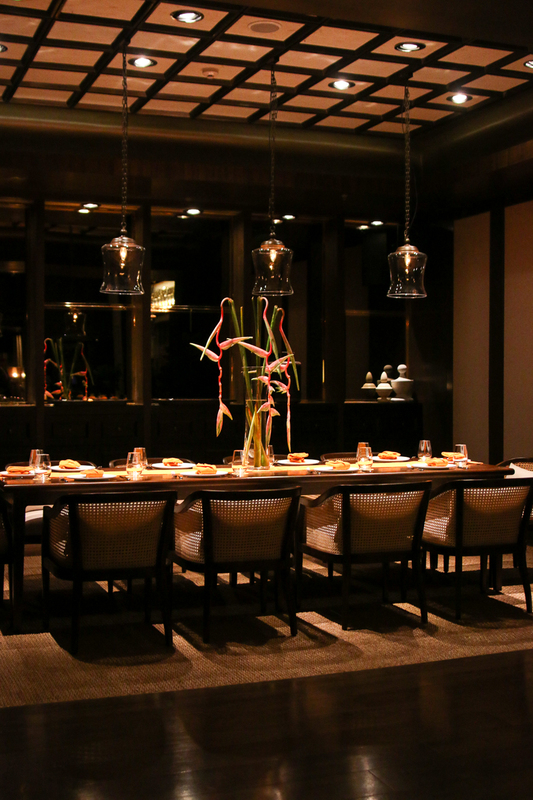 From the entrance, a waitress walks you down an impressive staircase to take you to the dining area. 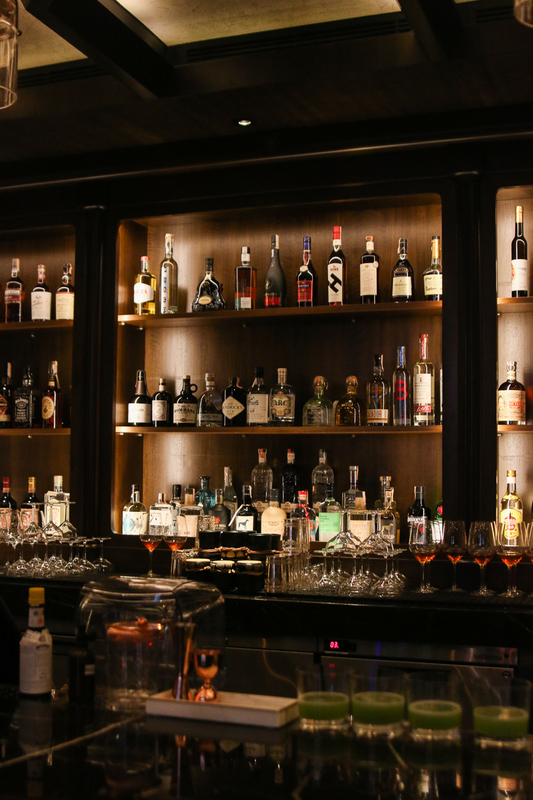 There’s a bar serving cocktails and spirits, and the lights are dimmed just enough to cast a ritzy glow everywhere. Then you look closely, and you see the crab theme popping up. 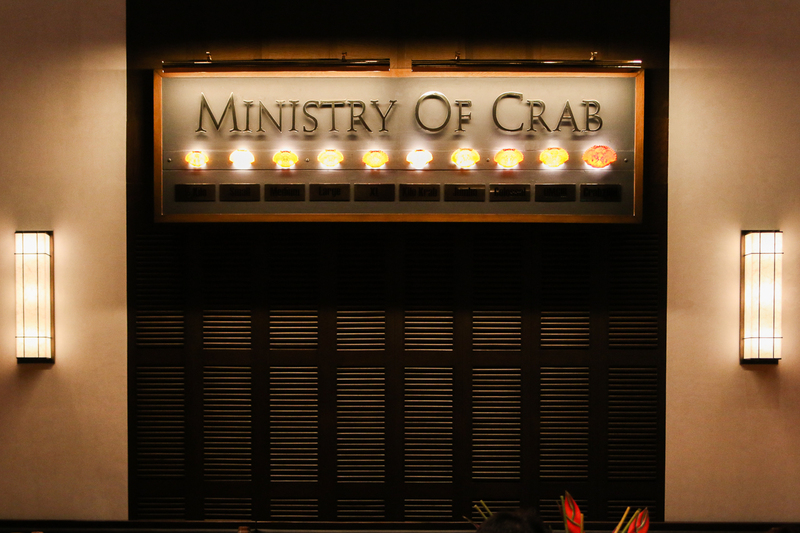 A sign saying “Ministry of Crab” is underlined with to-scale crab figures of increasing largeness—these reflect the sizes that the restaurant offers, and they light up depending on their availability. The coasters have tiny little crabs on them. Crabs even show up on the dining staff: each waiter or waitress that came to serve us had a little yellow crab temporary tattoo on their arm. It sounds like it should be tacky, but it isn’t. It’s almost audacious how Ministry of Crab mixes fine dining with the central, localized theme of crab. 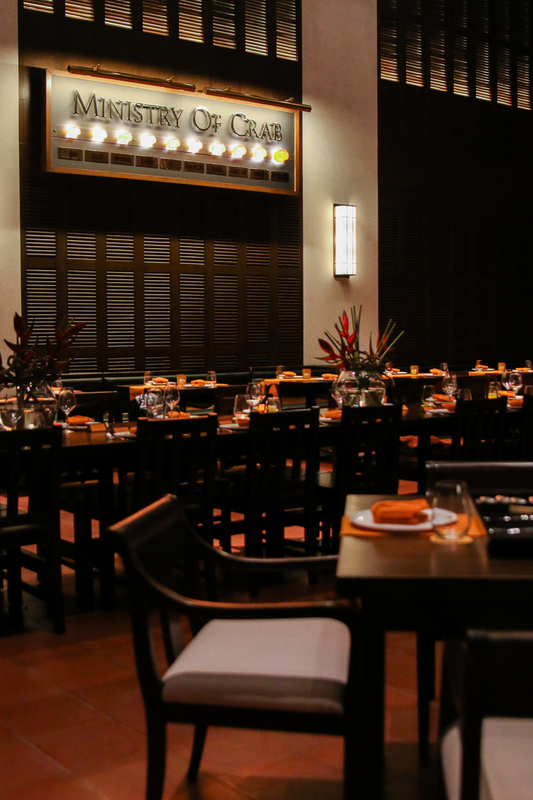 The self-assurance probably comes from the fact that the restaurant from Columbo, Sri Lanka is routinely on the list of the 50 best restaurants in Asia, and recently moved to the 25th spot last year. That’s pretty impressive for a restaurant started by cricket stars Mahela Jayawardene and Kumar Sangakkara and self-taught chef Dharshan Munidasa after lazily talking at a dinner table about maybe opening a place together. “If we last six months, we’d be lucky,” they said when they opened it in 2011. Crabs are very much at the front and center, of course, and that’s encapsulated pretty well by their Baked Crab starter. 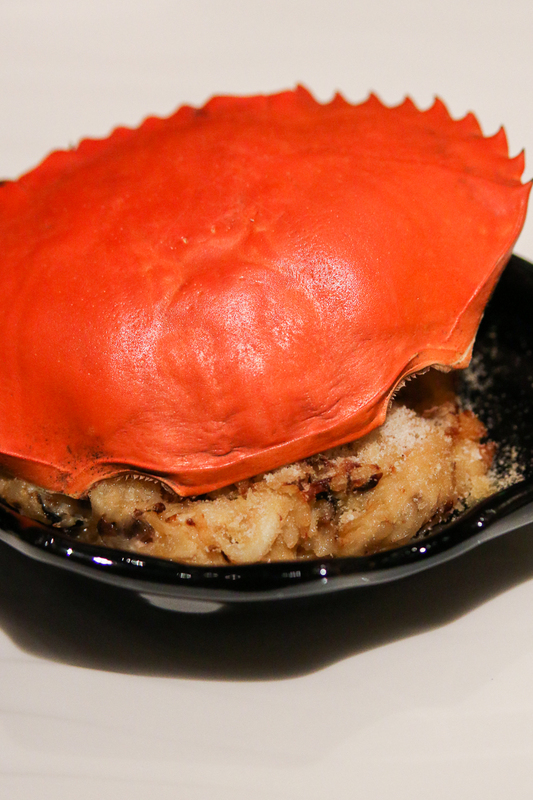 “The main ingredient in baked crab should be crab,” says the chef. It’s a filling dish made of chopped crab meat and rice, the crab meat’s texture making it taste a bit like a risotto. That doesn’t mean there aren’t any other kinds of seafood on the menu, though. 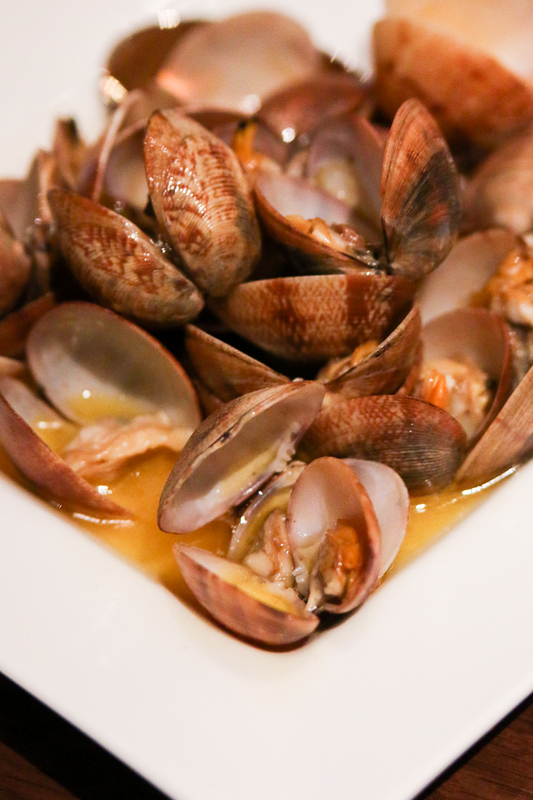 The clams and the prawns are also very good players, with the latter being sold by weight and cooking style, just like the crab, while the former’s drenched in butter and soy sauce. Hot tip: if you’re buying an oil-based dish at this restaurant, get the kade bread to go along with it. Kade bread is a bread common to the Sri Lankan streets (in that sense similar to our pan de sal), and it complements oil-based sauces perfectly. Dip the bread into the sauce and let it soak up as much liquid as it can. But the star of the show is undoubtedly the giant crabs. Huge crabs with weights ranging from 500 g to upwards of 2 kg, they’re cooked in six different ways. There’s a pepper crab, the garlic chili crab, the chili crab, the curry crab, the butter crab, and the two Philippine-based crabs: pinakurat crab (steamed with sukang pinakurat) and guinataang crab (prepared using gata and chilis). 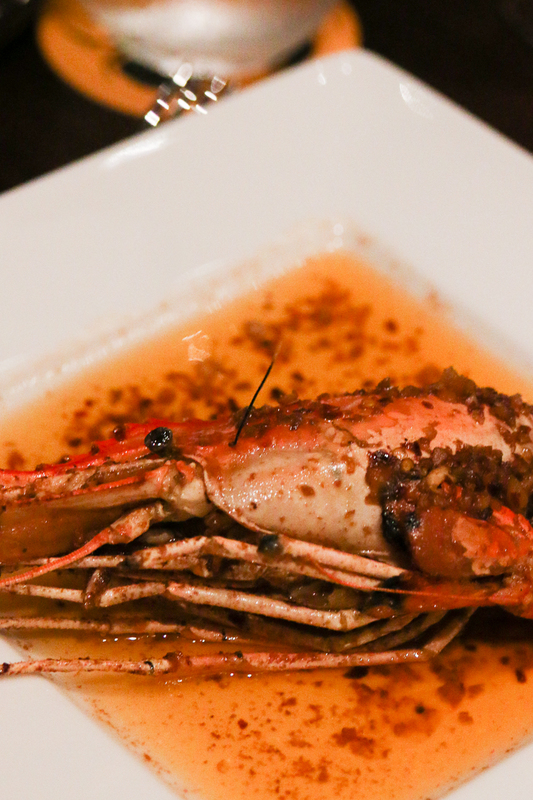 Many of these are the fusion of at least two different cultures; the garlic chili crab, for example, uses Italian olive oil, Japanese soy sauce, and Sri Lankan chili flakes. When ordering the crab, you’re expected to really dig into it, without a care to the mess that might make. In fact, you’re given an apron and a finger bowl made of tea and disinfectant to keep yourself clean. 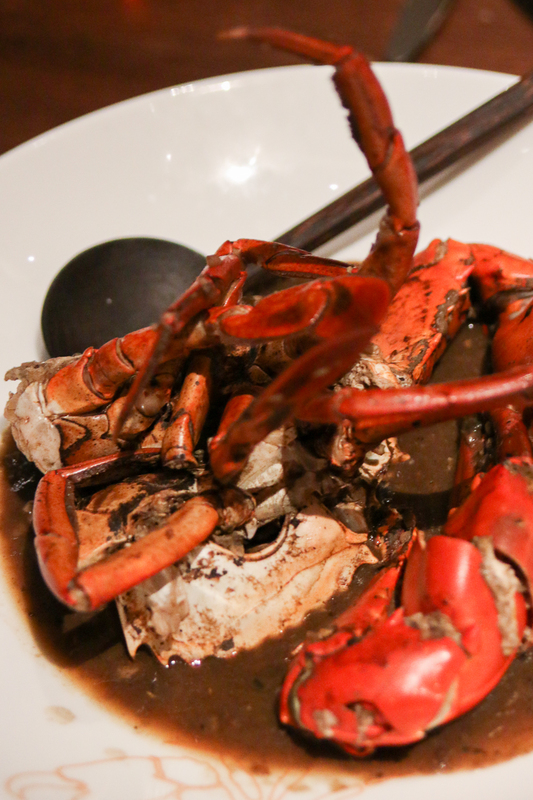 One impressive thing about the seafood served in Ministry of Crab is how fresh they are, eating the crab fat and the meat inside the prawn head, you can almost taste the sea. That’s because the restaurant doesn’t use a freezer: the crustaceans are kept alive until it’s time to cook them, following an old Japanese trick of keeping seafood as fresh as possible. 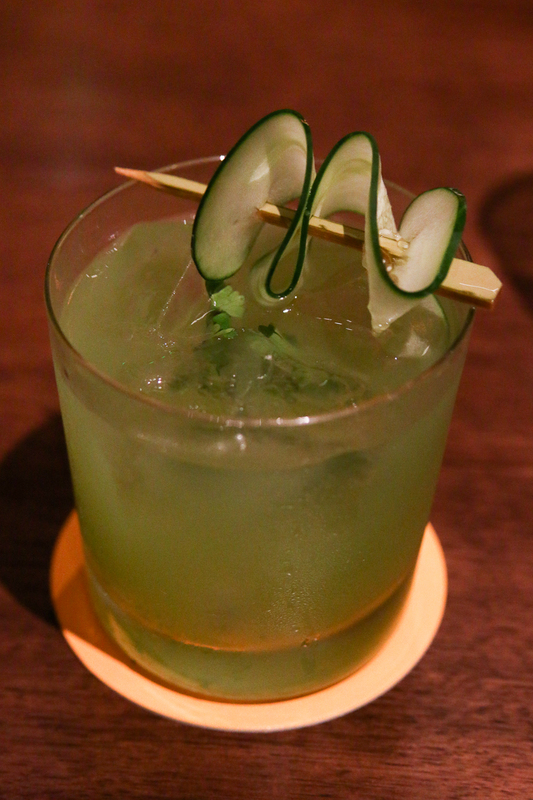 Ministry of Crab is formally opening on Jan. 16. The BGC branch will be its second international branch following Singapore, with plans to open in other Asian areas and in London in the pipeline.